We are a unique name in the industry to provide our precious clients the best quality Crane Hiring Service. In this service, we provide cranes to our clients on rental basis within the promised time-frame. To attain maximum clients’ satisfaction, our experts ensure that the cranes we provide on rent, have smooth functionality and are properly maintained. Moreover, this service is widely acknowledged by our valuable clients for its flawlessness and hassle free execution. 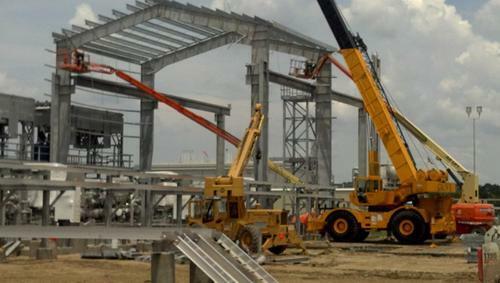 Erectofab Engineers is a reliable service provider that is engaged in rendering high quality Industrial Erection Service, Crane Hiring Service, Crane Rental Service, Structure Fabrication, Material Lifting Crane Service etc. We are a well known Sole Proprietorship firm which is incorporated in the year 1985 and providing reliable and well managed services across the nation and in a timely manner. We are located at Ahmedabad (Gujarat, India). Under the headship of our mentor, “Mr. Imran Khan Pathan”, we are able to gain a massive success across the nation.